The optimal follow-up for men after a benign biopsy is still unknown. Recent publications report a low risk for prostate cancer (PC) death after a benign biopsy and therefore question the need for further diagnostic interventions and follow up. The study population was derived from the screening group of the Göteborg randomised, population-based PC screening trial. The 10,000 men in the screening group have been invited for PSA-screening every second year up to the age limit of median 69 years. A PSA≥3 ng/mL triggered further investigations including a sextant biopsy. Date of last follow up was May 15, 2017. The primary outcome was cumulative PC mortality. Secondary outcomes were cumulative incidence of PC, cumulative incidence of Gleason score ≥7 tumors and treatment frequency. The Kaplan Meier method was used. 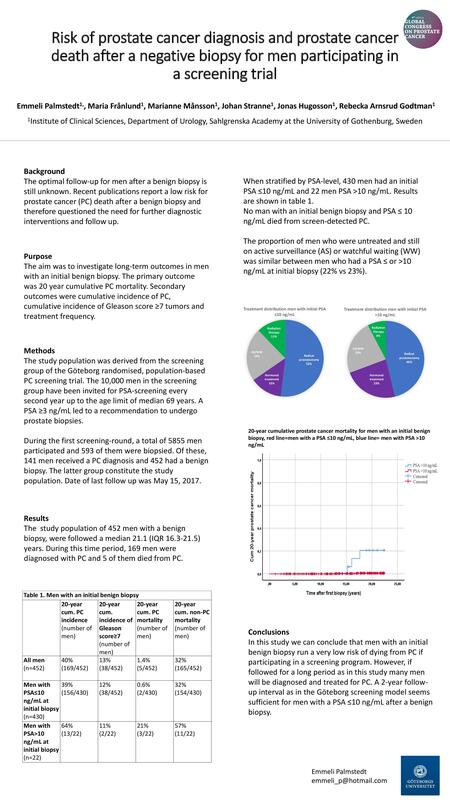 Of 5855 PSA-tested men in the first screening round, 593 were biopsied. Of these, 141 had PC and 452 had a benign biopsy. The 452 men with a benign biopsy were followed a median 21.1 (IQR 16.3-21.5) years. During this time period, 169 men were diagnosed with PC and 5 of them died from PC resulting in a 20-year cumulative PC incidence of 40.0% and a 20-year cumulative PC mortality of 1.4%. Cumulative incidence of Gleason score ≥7 tumors was 9.6%. When stratified by PSA-level, 430 men had an initial PSA ≤10 ng/mL and 22 men PSA >10 ng/mL. For the first group of men, the 20-year cumulative incidence of PC and PC mortality were 38.8% and 0.6%. In the second group, the corresponding figures for incidence and mortality were 64.4% and 21.4% respectively. No man with an initial benign biopsy and PSA ≤ 10 ng/mL died from screen-detected PC. The proportion of men who were untreated and still on active surveillance or watchful waiting was similar between men who had a PSA ≤ or >10 ng/mL at initial biopsy (22% vs 23%). In this study we can conclude that men with an initial benign biopsy run a very low risk of dying from PC if participating in a continued screening program. However, if followed for a long period as in this study many men will be diagnosed and treated for PC. A 2-year follow-up interval as in the Göteborg screening model seems sufficient for men with a PSA ≤10 ng/mL after a benign biopsy.